Palm Beach can boast some of the best luxury resorts in the country, so it is easy for families to stay at the beach and miss all that the island offers— except for maybe a mandatory ice cream run to Sprinkles. After our beach vacation, my son and I said goodbye to my husband and daughter, and we ventured towards Worth Avenue for a stay at the Chesterfield Palm Beach (check your dates for rates). The Chesterfield is a registered historic building, and since the 1920s, the pink stucco structure has been a bastion of Palm Beach tradition. It’s situated one block from Worth Avenue and within walking distance to the area’s shopping, parks, and beaches. The most recent chapter of the Chesterfield started when the Tollman family purchased it for their Red Carnation Hotel Collection ((affiliate link) in 1989. The South African couple behind the brand named their hotels for the red carnation that Stanley Tollman used to adorn his lapel. There’s a sister property in London called the Chesterfield Mayfair in addition to the Milestone Hotel, the brand’s London flagship. 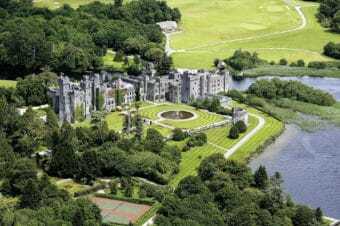 Their most famous property is Ashford Castle in Ireland, voted the best hotel in the world by Virtuoso in 2015 after their renovation in 2013. I had always underestimated the carnation until my visit to the Chesterfield. A tightly bound carnation bouquet can rival the elegance of any rose. The Chesterfield Palm Beach manages to be one hundred percent old school while being continuously refurbished updated. The culture of its service is intimate. There are less than sixty rooms and suites. The fringed and tasseled British lobby is commanded by its two front desk agents who serve as the guests’ points of contact for anything, and they do know everything going on around them. The Chesterfield feels woven into the lives of many Palm Beach residents. From my conversations with other guests, it seems like the hotel is on speed dial to book rooms for themselves when their homes have plumbing emergencies or for when their friends and family arrive in town for a visit. The Chesterfield rooms are snug but elegantly appointed with walls covered in classic beige and ivory stripe fabric, not wallpaper. Our room boasted a substantial amount of custom carpentry and was perfectly cozy for two people. I had never seen a television remote sanitized and sealed in a bag. I think this should become a hospitality standard for all four and five-star properties now. Families will want to spend the money on the hotel’s one and two bedroom suites, as most standard rooms would be too small for more than two people unless you simply needed to add a crib. The most famous aspect of the Chesterfield is undoubtedly the Leopard Lounge. 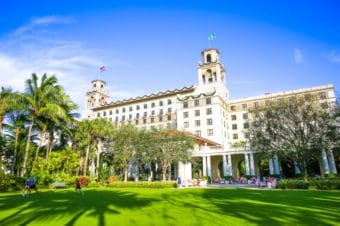 The moment you enter, you know that you’ve found a legendary enclave of Palm Beach’s secrets, scandals, and celebrations. The hand-painted red and white ceiling combined with black patent leather banquettes and plantation ceiling fans radiate a sensual but refined vibe. Even though it was daylight and I was with my son who was eating a grilled cheese, the room’s glamour conjured thoughts of childfree nights of drinks at the bar and fabulous people watching. The ceilings of the Leopard Lounge at the Chesterfield Palm Beach are simply stunning. The Leopard Lounge in the Chesterfield draws those who’ve been coming here for decades as well as newer guests who really appreciate the more intimate service that the Chesterfield can offer. The Leopard Lounge offers a complimentary breakfast buffet for its hotel guests that includes cereals, hard-boiled eggs, and pastries. There’s not a children’s menu for breakfast, but their kids’ menu for lunch and dinner perfectly suited my son, and the restaurant staff accommodated him with smiles and expertise. My son is quite seasoned going through a buffet, and when I let him go by himself to retrieve a croissant, every guest in the restaurant watched him carefully for some pending disaster. As he returned with a smile, I could feel the other guests exhale that all was well. This is not an Orlando crowd, so expect no tolerance for poorly behaved children from the other guests. Children will love the glass apothecary jars filled with candy next to the host’s stand. If those treats aren’t enough, the hotel provides addictive chocolate chip cookies in the lobby each afternoon. One reason that we chose the Chesterfield in town was because of the Little Prince and Princess afternoon tea that they offered, sending us the signal that families were welcome. 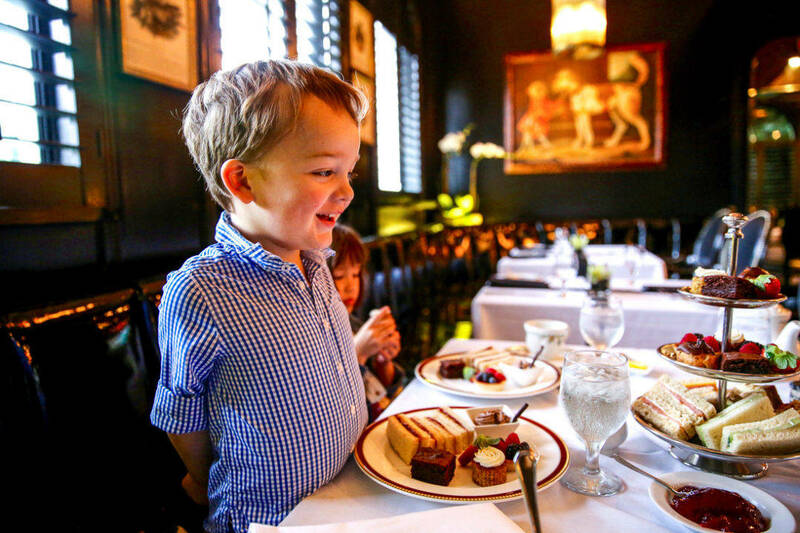 We called our local friends so that we had both a prince and princess in tow, and after launching our stay in Palm Beach with Bloody Mary’s and Shirley Temples at Ta-boo we headed back for an afternoon tea. A Bloody Mary at Ta-boo on Worth Avenue is a Palm Beach ritual. The elegant surroundings are such that the 4-year-olds easily found their inner etiquette experts. Apparently the tea is typically served in the Chesterfield library, which is absolutely charming, but, to be honest, it can’t really hold a candle to a Leopard Lounge corner banquette, so I was happy the library was full. If walking is not your thing the Chesterfield still has you covered. A lovely British man named Ken has retired to the area and his daughter-in-law, Sally, is concierge at the Chesterfield. 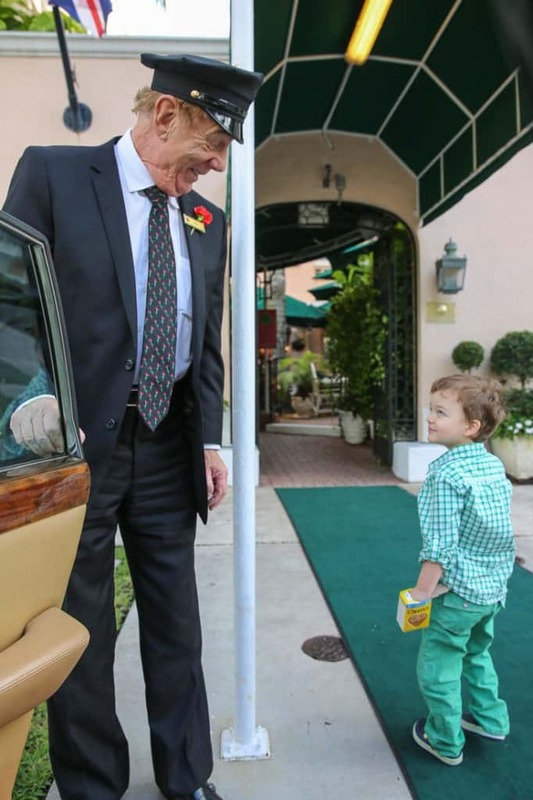 Ken is delighted to provide a chauffeured tour of Palm Beach in the Tolland’s British racing green Rolls Royce. My son had brought his tiny box of Cheerios from the breakfast buffet that I hadn’t noticed, but I’m not sure he was the first to enjoy Cheerios while looking at the Flagler Museum and the other impressive historic and new architecture around the island of Palm Beach. We drove around the two main commercial areas on the island where Ken would point out historical facts of interest, and we drove along South Ocean Boulevard to take in the sight of the impressive Palm Beach hedges protecting the privacy of the homes behind. The real estate made the views of the blue water look a little mundane. I was very sad that the day we took our tour, a Monday, the Flagler Museum was closed, so it remains on my bucket list for another visit to Palm Beach. Sadly, Ken does not offer airport transfers in the car, but most transfers on the island can be arranged. The Flagler Museum was closed on Mondays. Next time. The pool at the Chesterfield is a wonderful haven in the center of town. Pink towels, lemonade, and fruit provide poolside treats for a few moments of quiet. Guests can order from lounge menus on pink fans. The Courtyard at the entry of the hotel is another place for al fresco dining. A fantastic perk to traveling to Palm Beach is that it is the home base of Sitters in a Second, Inc., a hotel babysitting company that works with many five star hotels in Florida and California. Julia and I had agreed to meet in the room at the end of our appointment, and I went up and knocked on the door, but no one was there. I paused in that millisecond panic every parent would, and said, “Check the tables by the pool,” in my head. Of course, I found my son poolside thirty seconds later chatting away with Julia as she was reaching over the table cutting his grilled chicken. He did not run to me and cling onto my leg. He was quite content. I should have stayed out longer. Worth Avenue offers many hidden courtyards and gardens as well as galleries, clothing and antique stores. I loved being so close to Worth Avenue, where I wandered a few hours on my own. For those not enticed by its shopping, the architecture is worth seeing at least once. The only time I can recall enjoying such magnificent architectural details in shopping arcades are those of Paris and London. My son insisted that we return to the library he had just visited with Julia earlier that day. It wasn’t just any library. The Society of the Four Arts is an amazing community feature for Palm Beach. Part sculptural gardens, library, performing arts and educational center, its offerings are extensive for adults and children. I saw one of the most impressive libraries for children that I’ve ever seen. In addition to a traditional reading space and classroom where I saw kids create their own colorful succulent displays, they are able to check out toys and puzzles. There were large binders of Lego sets that my son scanned through, chose his selection, and headed to a table to assemble a Lego helicopter. The Society of the Four Arts has an outstanding library for children that offers games, puzzles, and Legos. This is clearly the place where seasonal residents and visiting grandchildren congregate. Definitely check your travel dates to Palm Beach with the event calendar at Four Arts. 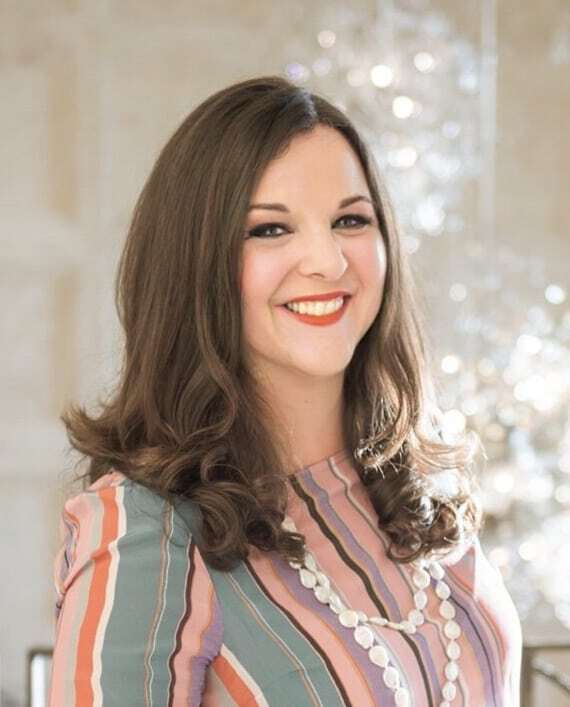 There are many great family events, everything from Easter egg hunts to an “ice cream and arias party” with a performance presented by the Palm Beach Opera, family sing-a-longs, and an ice cream social. The Society of the Four Arts, Palm Beach provides robust community programs in the four arts. The Society of the Four Arts, Palm Beach is free an open to the public and provides robust community programs. For me the Chesterfield provided a perfect taste of living in Palm Beach, or better yet, having grandparents who do. Although we were guests of the Chesterfield, these opinions are entirely my own. Sitters in Second provided free babysitting for purposes of this review, but my opinions are entirely my own. No one accepts even free babysitting from a company that seems less than perfect, fully insured, licensed, and bonded, right? 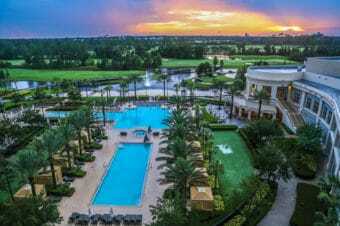 A Luxury Food & Art Tour of Orlando...Yes, Orlando! Looks great! I’ve never been to Palm Beach just seemed a place to visit if you have relatives retired there (and we don’t!). I love the library though – very cool. I should definitely rethink my opinion of Palm Beach! Love the elegant combination of old school, but modern amenities and luxury too. A great place to wind down, but wonderfully set up for kids too. Love it! I have never been to Palm Beach but would definitely consider staying at the Chesterfield Palm Beach if we are in the area. The hotel looks very elegant and I love fabric walls- they are so rare nowadays. The children’s library is a huge selling point for me too. Thanks for sharing. That leopard lounge looked amazing. I love how it’s a family friendly property, but still managed to retain its charm and elegance. Wow! What an elegant and unique space! Love all the photos of your adorable son–looks like you had a wonderful time together. This looks like a fabulous place to stay! I love how the other guests held their breath as your son went to the breakfast buffet. I could totally see that happening. The sitter service sounds amazing too. What a great amenity to have for guests. Looks like another destination to add to our list! Looks like they cover all the bases! My kids would go nuts when they saw the apothecary jars filled with treats.